Join DC Strings Orchestra in their 5th concert of the season, A Celebration of Community, held at the historic Capitol Hill Presbyterian Church in SE DC. The program will include artists and winners from our 2nd Annual Concerto Audition in addition to works of Beethoven and Mussorgsky and spoken word. For more information, please visit dcstrings.org. Metro is preferred as parking can be challenging. Join the Messiah Chamber Orchestra and the choir of National United Methodist Church in a presentation of the Brahms Requiem. Led by conductor Jeffry Newberger, this will be an event not to be missed. Brief reception to follow. Join members of the DC Strings Orchestra, a project of DC Strings Workshop in what has become their annual Black History Month. Music Director, Veronica Jackson conducts. The program will feature works of Bernstein, Ellington, and Dvorak. ARTISTIC DIRECTOR ANDREW LEE performs at National United Methodist Church as part of the service. Andrew Lee (piano) & Johny Walker Jr (cello) perform as part of the Black Composers Concert, an annual Black History Month celebration at Dunbar High School in Washington. Works performed include Coleridge-Taylor and Bach. DC Strings members Andrew Lee and Johnny Walker Jr, perform Bach’s 3rd Cello Sonata at theARC in SE Washington DC. Join members of the DC Strings Orchestra in a Bach Magnificat Presentation as part of the National United Methodist Church Service. Join the DC Strings Orchestra, in what has become an annual tradition in historic Anacostia. The program features Handel’s Messiah, Polar Express and traditional spirituals. Veronica Jackson, music director conducts. Join the Messiah Chamber Orchestra, a project of DC Strings Workshop in what has become an annual tradition on Capitol Hill. The program features Handel’s Messiah, Saint-Saen’s Christmas Oratorio, and Corelli’s Christmas concerto. Jeff Kempskie, Music Director at St. Marks conducts, Benjamin Bodnar concertmaster. Andrew Lee, joins the DC Dream Center in its annual holiday party for a few festive tunes. 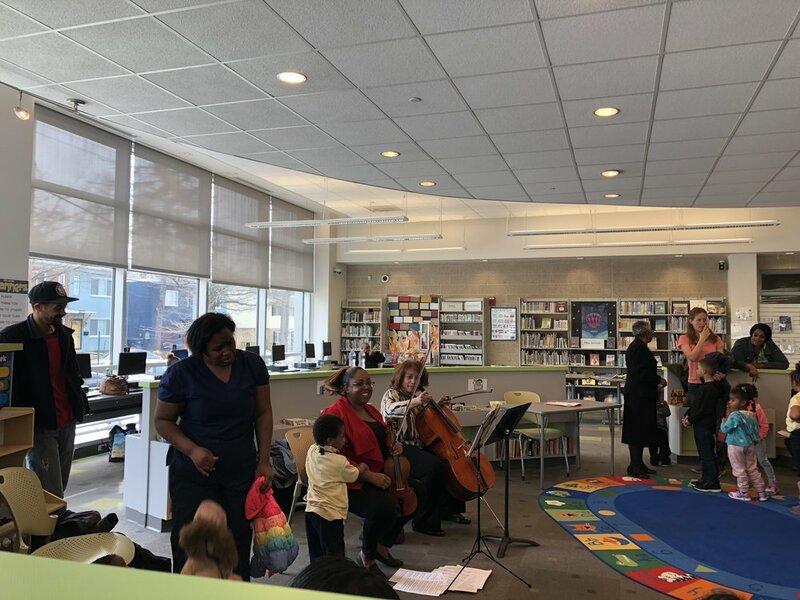 Members of the DC Strings Orchestra presented a program of eclectic works, including ragtime and classical to young elementary and middle school students. 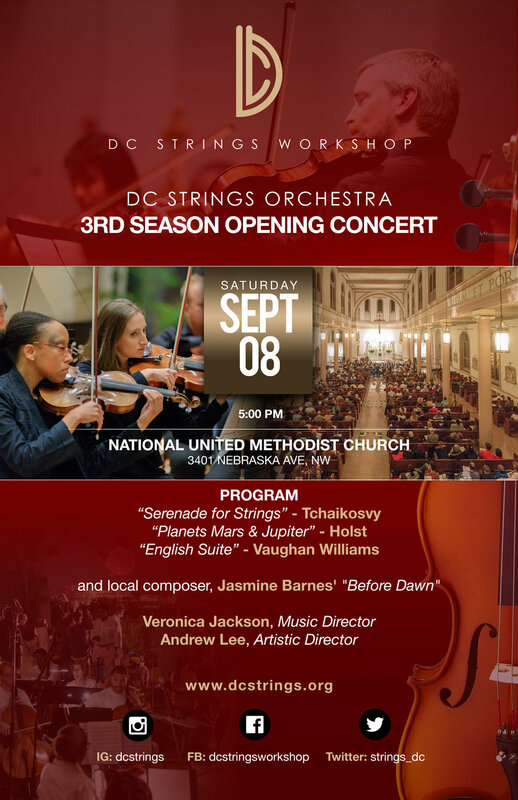 Join members of DC Strings Workshop in what has become an annual tradition at Metropolitan AME. The program will feature Parts I and II of Handel’s beloved Messiah. Stanley Thurston conducts. Join DC Strings Orchestra in their 2nd concert of the season held at the historic St. Augustine's Episcopal Church in SW DC. The program will include artists and winners from our 2nd Annual Concerto Audition in addition to works of Schumann and Haydn. For more information, please visit dcstrings.org. Parking is suggested at the Safeway or across the street at Arena Stage. Join the DC Strings orchestra in a fun, family-friendly outdoor concert. Food and refreshments will be served. (AU Park), DC Strings Orchestra 3rd Season Opening Concert, Sat. September 8 at 5pm. Join music director Veronica Jackson, and musicians from DC Strings in a performance of classical and modern works. DC Strings premieres, ‘Before Dawn,’ a work from local composer Jasmin Barnes. National United Methodist Church (3401 Nebraska Ave, NW). Suggested donation $15, more info at dcstrings.org, donations accepted. Join the DC Strings quartet in a fun, family-friendly outdoor concert. Food and refreshments will be served. Join friends of DC Strings in a night of music making. Sponsored in part by support from the Capitol Hill Community Foundation. DC Strings Workshop Presents Robin Fay Massie (violist) in Recital! DC Strings Workshop is proud to present Robin Fay Massie, a professional violist in recital with friends. Experience works of J.C Bach, Brahms and others in this riveting program. FREE Concert, although a suggested donation of $10 and contributions are accepted. **Limited street parking, Safeway garage is recommended or early arrival. Now in its 2nd season, you're invited to join the DC Strings Orchestra in their final concert series of the season with Guest Conductor Ahmed Alabaca of Los Angeles. Soloists are concreto winner Genesis Banks, Van Parker and others. Experience works of Mozart, Dvorak, Rossini, and local composers in this stirring and exciting program. FREE Concert, although donations and contributions are accepted. Join DC Strings Member Alexander Powell (violin) & Artistic Director Andrew Lee in a rousing program inspired by Bizet's Carmen. Program begins at 7p. Now in its 2nd season, you're invited to join the DC Strings Orchestra in their spring concert with Guest Conductor Alan Buxbaum of the New York Youth Symphony. Concerto Soloists are Raycurt Johnson and Peter Clamp. Experience works of Beethoven, Elgar and Vivaldi in this stirring and exciting program. FREE Concert, although donations and contributions are accepted. Now in its 2nd season, you're invited to join the DC Strings Orchestra in their spring concert with Guest Conductor Isaiah Shim of the Peabody Conservatory. Concerto Soloists are Raycurt Johnson and Peter Clamp. Experience works of Beethoven, Vivaldi and Elgar in this stirring and exciting program. FREE Concert, although donations and contributions are accepted. DC Strings Workshop was invited as part of the Community Day at the DC Dream Center. We're excited to share more about our offerings in the community including private lessons, our orchestra and various ensembles. DC Strings Artistic Director Andrew Lee & member Alexander Asemota, join Levine School of Music students in concert, performing works of Mendelssohn, Bach, and others. The DC Strings Quintet performs a program of works in honor of the Frederick Douglass Bicentennial. The program includes works from Bach, Mozart, and Nathan Carter. Vaughan Octavia & Drea Mast violins, Jacob Dennis viola, Nneka Lyn cello, & Sanjay Arora bass. Guest artists Andrew Lee (piano) & Daniel Rich (baritone) join the quintet. Conductor Stanley Thurston leads DC Strings in a stirring program of music commemorating the life and legacy of Frederick Douglass. Inspired by Douglass' time in Ireland with Holst's St. Paul Suite, the Suk Serenade for Strings, and several spirituals. Soprano soloist Brittany Johnson and Baritone Aaron Reeder join DC Strings in concert. February 2018 makes it 200 years since Frederick Douglass was born into this world. Born enslaved, he sought his freedom and against all odds, rose to a life of honor by becoming a statesman, journalist, activist, hero and so much more. Join the National Park Service for a yearlong commemoration as we honor the history of Douglass's life, his connection to the community and his commitment to social justice. The grand bicentennial kickoff weekend will be held on Saturday, February 17, and Sunday, February 18, 2018 at Frederick Douglass National Historic Site in historic Anacostia, Washington D.C. Conductor Stanley Thurston leads DC Strings in a stirring program of music commemorating the life and legacy of Frederick Douglass. Inspired by Douglass' time in Ireland with Holst's St. Paul Suite, the Suk Serenade for Strings, and several spirituals. Soprano soloist Shirli Hughes and Baritone Aaron Reeder join DC Strings in concert.